September 19, 2018, 6:30 p.m. When it comes to suggesting what someone should drink at a party, barbecue, or after work during happy hour, Hispanic adults currently residing in America are more likely than the general US public to recommend a product from Mexico. According to new data from YouGov Plan & Track, Hispanics are more likely to suggest trying Corona and Dos Equis if someone’s in the mood for beer, and Patron and Jose Cuervo if someone would prefer liquor. At present, 39% of Hispanics would recommend Corona to a friend or colleague, compared to 24% of the general public — a difference of 15 percentage points. Meanwhile, 23% of Hispanics endorse Dos Equis. 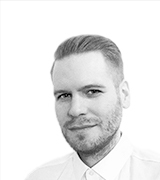 The same is true for 14% of all American adults, resulting in a nine-point gap. 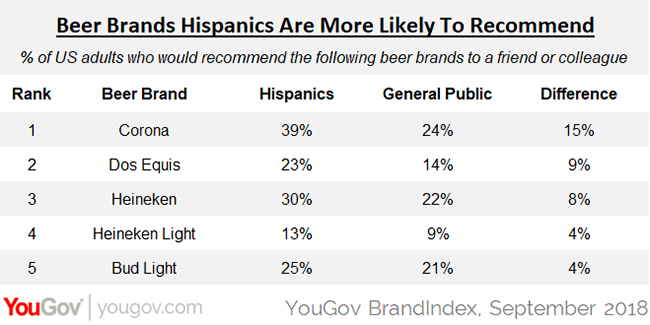 Overall, Hispanics are also slightly more likely than the general public to encourage friends and colleagues to try Heineken, Heineken Light, and Bud Light. As for liquor brands, 28% of Hispanics living in the US recommend Patron, compared to 18% of the general public. The difference in recommendation levels for Jose Cuervo is nine percentage points, with 27% of Hispanics and 18% of US adults at large standing behind the Mexican tequila. Bacardi ranks highest among Hispanics (32% recommend it), but the rum also does relatively well among the general public (25%). Additional numbers from YouGov Plan & Track indicate that 39% of Hispanics enjoy going to bars to drink, compared to 27% of the general public. At the same time, 37% of Hispanics report that they are usually happy to drink whatever everyone else is having, compared to 28% of all US adults.